The first season of the incredible MILLIONS poker tour ends in April with the Millions Grand Final Barcelona. There'll be a staggering €10,000,000 GTD prize pool! Beginning today, Intertops Poker and Juicy Stakes are running satellites to the Open $1M GTD, the opening event. The winner of the online poker tournament Final on February 11 gets a $4500 prize package to compete in the Mediterranean resort. The prize package includes €1100 buy-in for the Open €1M GTD NL Hold’em opening event, 5 nights accommodation at the Hotel Arts Barcelona and US$700 toward travel expenses. “Barcelona is definitely one of the coolest cities in the world and this is an amazing event with some ridiculous money to be won,” said Intertops’ poker manager. 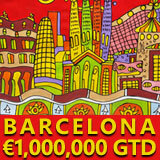 Online poker tournament winner will win trip to Barcelona for live tournament with €10,000,000 guaranteed prize pool. The Open €1M GTD starts on April 7th and ends on April 10th. Day 2 begins April 9th after four Day 1s. The tournament takes place at Casino Barcelona, just steps from one of the nicest beaches on the Mediterranean. You can buy-in to a Step 1 satellite for just $3 + $.30 and win your way to the Final, or you can buy in at any stage of the three-tier tournament. Intertops Poker and Juicy Stakes are known all over the world for their busy poker rooms on the Horizon Poker Network. Previous online satellite tournaments have sent winners to live events in Europe (Austria) and the Caribbean (St Maarten and Punta Cana). They also offer a selection of slots and table games from Betsoft, Worldmatch and Lucktap.